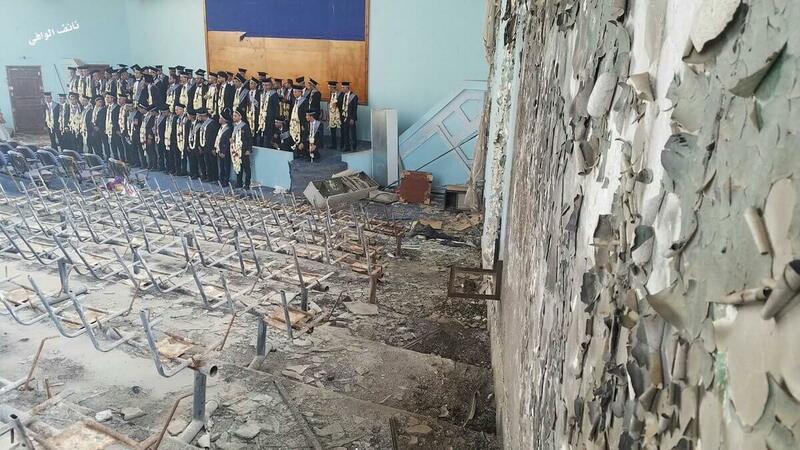 Graduation ceremony in a destroyed hall at Taiz University (Photo by: Yemen Akhbar). SANA’A—Though never a top producer of scientific research in the Arab region, Yemen had achieved a steady output of scholarly studies in recent decades. However, the continuing civil war over the past four years now threatens to stop the conduct of scientific research there almost entirely. Since March 2015, a Saudi-led coalition has carried out air strikes targeting the rebels known as Houthis and their allies, namely forces loyal to former Yemeni leader Ali Abdullah Saleh. Over the following two years, the conflict has spread, and fighting has engulfed the entire country. There is still no official assessment of the material losses Yemeni research centers have suffered as a result of the fighting. But more than 43 government scientific centers affiliated with Yemeni universities have stopped operations because of damage to their facilities, according to Yemen’s Ministry of Higher Education. Some 15 independent research centers have also been out of work due to the suspension of support from international donor organizations, and some of them have been stormed by armed groups, according to local human rights organizations. Statistics are also missing on the number of casualties among university professors or academic researchers. But according to the World Health Organization, more than 9,200 Yemeni civilians have been killed in the conflict, while more than 52,000 others have been injured. An estimated 22.2 million Yemenis, or about 76 percent of the population, needed assistance over the past six months, according to a new report by the United Nations Office for the Coordination of Humanitarian Affairs. Before the war, Qasim managed to conduct some research in politics and sociology at Sana’a University with the financial support of institutions outside Yemen, like the Arab Reform Initiative, a consortium of policy analysis institutes. But the outbreak of the war caused all research cooperation projects to stop. “Communicating with overseas research centers or collaborating with other researchers is almost impossible because of the blockade imposed on the country and the difficulty of contact, communication and transfer of funds,” he said. Many local research institutions have also stopped work. For example, the Center for Studies and Research in Sana’a, which was established in 1979 by a presidential decision and issued more than 150 papers and research on politics, economics, law, literature, philosophy and other fields before 2014, was unable to issue any research papers during the past year after its budget was completely halted, including staff salaries. 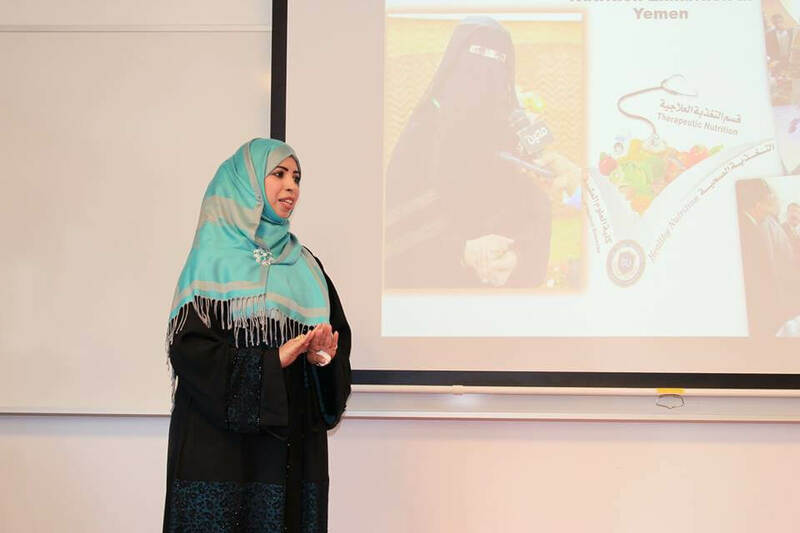 According to its media office, the center’s work is currently limited to providing technical and methodological advice to independent researchers and master’s and doctoral students in Yemeni universities and providing them with scientific references and previously conducted studies. Master’s and Ph.D. students face increasing difficulties in conducting their research. Ahmed Abdul Rahman, a geosciences researcher at the University of Dhamar, was unable to complete his master’s thesis on earth layers in Al-Jawf region in northern Yemen, close to the Saudi border, because of clashes in the governorate. “Since 2014, I have not been able to visit Al-Jawf and complete the research,” said Abdul Rahman. “So I have not been able to submit my master’s thesis on time.” He noted that a large number of his colleagues were also unable to complete their master’s or doctoral studies, and that many have changed their research topics to theoretical ones to overcome the difficulties of carrying out practical research. Meanwhile, the split in Yemen between two governments—the Houthis in Sana’a and the remnants of the previous government in Aden—and two ministries of higher education has further disrupted Yemeni researchers’ efforts to document and preserve their work. What is admitted by one government is rejected by the other. With the difficulty of conducting research, and as security and living conditions continue to deteriorate, many researchers are considering leaving the country. Most Yemeni researchers who depart go to Egypt, Jordan, Sudan or Turkey, but many others have moved to Europe as refugees, and most of them will not be able to work in research again, Ghanem said.